Feng shui indoor water fountain tips can help you get an extra boost from this powerful feng shui tool. A water fountain can be used to activate, weaken or destroy inauspicious elements. The general rule for a feng shui indoor water fountain is to place it in the wealth sector (southeast compass direction) or the career sector (north compass direction). These placements will activate the sector to stimulate the chi energy and impact this area of your life in an auspicious way. Allow the fountain to run a minimum of 5 to 6 hours each day. Since the wood element activates the southeast wealth sector you can use a bamboo water fountain in this sector to reinforce the wood element. You can use a fountain that is filled with Chinese coins to further impact your wealth luck. A fountain that features a three-legged toad is very auspicious for the wealth sector. Further nurture auspicious chi by placing a few houseplants around your water fountain. A water fountain featuring three or more water moulins (chutes) for the water to travel and accumulate in a basin signifies money coming from different directions (income streams) and then it all comes together so you can accumulate this wealth. Although rarely discussed, you can also place a feng shui indoor water fountain in the health sector. Like the southeast sector (wealth luck), the east sector (health luck) is governed by the wood element. Choose a bamboo water fountain for this sector or another type of wood fountain, such as a wishing well or simple barrel bubble fountain. A living water fountain is a good choice for this sector. This type of fountain allows the addition of aquatic plants inside the fountain, similar to an outdoor pond. Since this fountain is usually large and heavy, it's typically placed on the floor. Keep the water clean by containing the roots in an underwater pot. A floor wood alpine fountain that features falling water offers an aesthetically pleasing touch while repeating the cascading effect of a waterfall that symbolizes the constant flow of auspicious chi energy. You can give your efforts a big boost when you select a water fountain that can support fish. In feng shui fish moving through water generates auspicious chi energy. Some water fountains are a combination of a water fountain and aquarium. There is an exception to the southwest rule against using a water element since earth destroys water in the destructive cycle. During the Period 8 that began in 2004 and ends in 2024, you can place a waterfall style water fountain in the southwest. The southwest is the wealth sector during Period 8. It is only during this timeframe that the southwest is transformed into a wealth sector. Make sure the waterfall flows into the room, not out through a window or door. You can set the waterfall fountain in the southwest corner of a north, east or southeast sector to amplify the wealth luck. 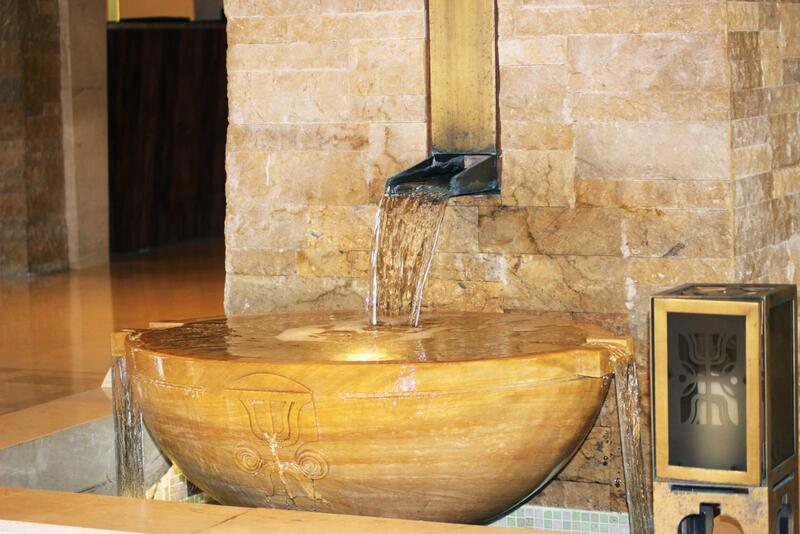 You can also select fountains that depict or contain the earth element (southwest) for a greater presence and impact. Choose a fountain with a crystal ball that spins or add your own crystals about the fountain to attract the earth energy that governs this sector. 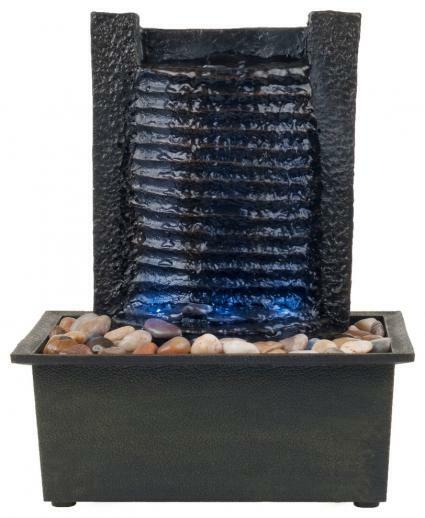 Select a waterfall fountain made of slate ledges (earth element) for the water to tumble over. Set an amethyst tree beside your fountain or other amethyst crystals to activate the love and relationship luck for an additional boost from the yang energy generated by the fountain. This will ensure you also receive a wealth of love. You may choose a living water fountain that features moss covering the various waterfall levels to represent the earth element. You can select a bubble or cascading fountain made of ceramic/pottery for a more earth-related element. There is one instance when you can use water to destroy the fire element. If the north sector of your home features a fireplace, it isn't realistic to remove the fireplace. Even if you aren't using the fireplace, it is still a large fire symbol in a room that is governed by water. You can activate the water element and counter this inauspicious energy by adding a feng shui indoor water fountain. If possible, place the fountain beside the fireplace and let it run a minimum of six hours every day to destroy the fire element. You can use feng shui indoor water fountain tips to take advantage of the water element to activate the chi energy. Use a water fountain in the appropriate sectors to receive auspicious chi energy in these areas of your life.